Are you looking for childcare for your wedding or event? Newport Nannies, LLC specializes in this service throughout Rhode Island. Whether we’re watching kids at a reception venue, a hotel, or a professional conference you can be sure that your children are being taken care of by mature, responsible, fun-loving adults – so that you can enjoy yourself while celebrating in the Ocean State! 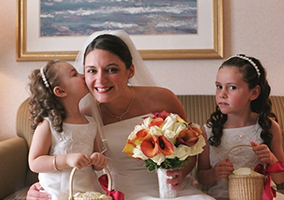 I am so happy with my decision to use Newport Nannies last week while in town for a friend’s wedding…As soon as I contacted Jennifer, she was professional and responsive. I liked the fact that she sent a contract outlining her exact duties, and that she called ahead of time to confirm all information. Once Jennifer arrived, it was apparent that she loves children…It is a shame I don’t live in the area or I would steal Jennifer full-time! I think that every bride that has kids should use your service…the price was great and the money we spent was worth every penny. The children in my life are so special to me, and it was important that I have them at our wedding. With Newport Nannies we were able to have an indoor, formal wedding with the kids there. That's something I didn't think would be possible! Both the childcare providers at our wedding were fun, gracious, and most importantly the kids loved them. I also couldn't believe the amount of activities you had ready for the kids! Boredom was not going to be an option! I wish the best for all of you! When exploring our options for finding a babysitter, my husband and I had great trepidation about leaving our boys with someone we did not know… However, back when we spoke for the first time, I knew right then and there you would be the best choice for watching our little boys. You are such a warm and caring woman, as well as responsible, reliable and trustworthy. In a nutshell, you are a consummate professional in the business of babysitting. You were fabulous! It was such a relief that she let you put her to sleep- she’s literally never done that before with someone she didn’t know already, and it really allowed us to enjoy our friends’ wedding. You have a natural way with toddlers! Jessica was wonderful. Cooper never cried or was sad before we left, and was happily sleeping when we returned. We walked out of a hotel room in a town we had never been to having left our child with someone we had never met, and because of the way Newport Nannies had set it up, we felt totally comfortable and had a great time. I just wanted to write you a quick letter to let you know how happy I was with Katherine and Newport Nannies. Lucy loved Katherine and so did we. She was great playing with Lucy and just as happy to watch her while she napped. My husband and I were able to enjoy all of my sister’s wedding. Most importantly I trusted her completely. Thank you again for accommodating us on such short notice. Thank you for the most amazing Nanny. Jessica was amazing, sweet, kind and so attentive. Without your help we could not have enjoyed my daughter’s wedding as we did. Our heartfelt thanks to you both! Amaiya keeps asking where did her fairy godmother go?? ?